The Daily Telegraph treats its readers to a photo gallery of Foreign soldiers who fought alongside the British in the First World War, such as these Bengal Lancers at their London camp in 1916 .
but my first impression of Detroit was good. It was not thanks to the government but to free enterprise and the hard work and aspirations to a better life of individual Detroiters. My first experience, and a few others after that, let me see glimpses of hope for Detroit. … The image of Detroit I had in mind was the one the media is spreading: a zombie city, where the remaining inhabitants, those who didn’t flee to the suburbs or further away, were left with abandoned and burned-down houses everywhere, where crime and drugs are rampant; the image of the fall of a formerly great American city. Media reports ventured: Detroit was once the epitome of American success; will it represent America’s future? Truth is Detroit is a city of many contrasts. Yes, the vision of a ghost town is everywhere, but downtown, the empty streets and the blight also stand alongside buildings filled with bubbly tech start-ups; some abandoned houses are taken over to make room for gardens. The heavy hand of government regulation and intervention is sometimes mind-bogglingly absent, for better or worse for Detroiters. Just like nature reclaiming abandoned houses though, free enterprise is slowly trying to find its way back through the hurdles of statism. … Detroit is fighting for its life. At the heart of the revival, is something quintessentially American: individuals taking responsibility for their lives, fighting the wilderness when necessary, convinced that they can make it on their own. If some insist in seeing Detroit as the future of America, this should be about this, not about the ruins of failed government policies. 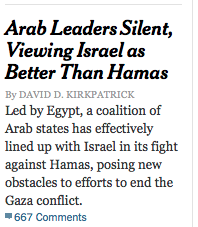 By Not Opposing Israel, Says NYT, Arab Nations Are to Blame for "New Obstacles to Efforts to End the Gaza Conflict"
Nothing should come as a surprise from the New York Times, correct? Egypt has led a new coalition of Arab states — including Jordan, Saudi Arabia and the United Arab Emirates — that has effectively lined up with Israel in its fight against Hamas, the Islamist movement that controls the Gaza Strip. That, in turn, may have contributed to the failure of the antagonists to reach a negotiated cease-fire even after more than three weeks of bloodshed. “The Arab states’ loathing and fear of political Islam is so strong that it outweighs their allergy to Benjamin Netanyahu,” the prime minister of Israel, said Aaron David Miller, a scholar at the Wilson Center in Washington and a former Middle East negotiator under several presidents. So how does the New York Times advertise David Kirkpatrick's story on its front page? new obstacles to efforts to end the Gaza conflict. Secretary of State John Kerry turned to the more Islamist-friendly states of Qatar and Turkey as alternative mediators — two states that grew in regional stature with the rising tide of political Islam after the Arab Spring, and that have suffered a degree of isolation as that tide has ebbed. But that move has put Mr. Kerry in the incongruous position of appearing to some analysts as less hostile to Hamas — and thus less supportive of Israel — than Egypt or its Arab allies. Today would be the 100th birthday of Louis de Funès, the comic French movie star who in 1971 criticized leftist humor as being "at the expense of others [and causing] sad, weeping laughter." Le Monde : Savez-vous que des jeunes considèrent votre comique sans cible politique comme démobilisateur et donc favorable à l'ordre etabli? Le Monde : Un nouvel humour apparaît, très critique. Qu'en pensez-vous? Nothing could be further from the truth. As society becomes increasingly hostile to people of faith, employees are discovering that they cannot keep their jobs and remain true to their sincerely held beliefs, which the Civil Rights Act of 1964 supposedly guarantees. That portion of the law everyone hypocritically claims to adore is routinely ignored. One solution has been to start your own business though that doesn’t always solve the problem. As the Green family of Hobby Lobby has learned, even being your own boss doesn’t guarantee that you can live your life according to your faith. You can’t practice your religion if you work for yourself and you can’t practice your religion if you work for someone else. What do you think this is? America? Schumer’s remarks were delivered at a press conference in support of the misnamed and ultimately doomed Protect Women’s Health from Corporate Interference Act, which ought to have been called the Abolish Religious Freedom Act because that’s what it really is. Its purpose was to do an end-run around last month’s Burwell v. Hobby Lobby decision, thus forcing religious business owners to purchase abortion-inducing drugs for their employees. Thankfully, it failed even in the Democrat-controlled Senate. Like most great charlatans, Chuck Schumer speaks out of both sides of his mouth. He is conscious that he sounds hostile to free exercise rights so he makes the effort to begin each sentence with a pro forma affirmation of his adoration for religious liberty, followed by the word “but.” If it sounds like lip service that’s because it is. … Nearly every government in the world pays lip service to religious liberty. Even the North Korean constitution guarantees that “Citizens shall have freedom of religion.” Such guarantees of religious freedom are a sham of course, brushed aside whenever Kim Jong-Un feels inconvenienced, which is almost always. As the aforementioned examples illustrate, in some localities religious liberty is just words on a page. For religious liberty to mean something it has to protect us from the Chuck Schumers of this world who claim to support that religious freedom jive unless it impedes their legislative agenda. Schumer’s insincerity is apparent when one of his sentences is broken in half. He begins by saying, “We wouldn’t tell the owners of Hobby Lobby to convert to a different religion or disobey their religion…” Well yes, as a matter of fact “we”—the government, that is—would. That’s exactly what this lawsuit was about. This first part of the sentence is the pro forma portion that Schumer doesn’t really believe because it isn’t true. “We” really do want to bludgeon the Green family into submission, which is why “we” wasted millions of taxpayer dollars trying to force them to comply with the illegal mandate. The senator continues: “…but we don’t say that they have to open up a company and go sell toys or hobby kits.” See? So the Greens brought it upon themselves by opening a business. They should have known that business owners don’t have the same rights as other people. … David Green … has always made his Christian values the cornerstone of his company. That wasn’t a problem for the first four decades of Hobby Lobby’s existence because the idea that a Christian business owner had a right to run his business according to Christian principles was remarkably uncontroversial. But then came the “You didn’t build that” mentality, which essentially argues that private companies aren’t really private. The people who take the risk of starting a business, run the day-to-day operations, pay the taxes and insurance, and meet the payroll are mere managers who can be overruled in all instances by an intrusive and all-powerful government, even when its mandates run afoul of the Religious Freedom Restoration Act or even the US Constitution. … Schumer’s contention here is that Americans can’t have it both ways. We can go into business for ourselves or we can have our constitutional rights but not both. That’s too much freedom. It makes Chuck woozy. writes Sylvie Kaufmann in Commentary. A few months earlier, his half brother, Jean-Daniel, 22, had also been killed in Syria. The two had traveled together to Syria from Toulouse. Once there, they became poster boys for foreign jihad. They even posted a video on YouTube, calling on their “brothers” in France to join them. [Their mother, Dominique] Bons, herself an atheist, had watched helplessly as Nicolas changed his lifestyle, turning away from friends, drinking, dancing, dating. But when he sent a message from Syria, she was at a loss to understand. Stories of homegrown jihadists are becoming tragically familiar this year in France. A month after Nicolas’s death, also in Toulouse, two teenagers (whose names have not been released as they are minors), left one morning apparently to go to school; instead, they went to the airport and boarded a plane to Istanbul. … Foreign fighters in Syria come from all over Europe, but the French have provided the biggest group. French journalists held since last year in the infamous “factory of hostages” area near Aleppo, and released in April, were dismayed to discover that some of their hooded guards were, in fact, their countrymen. This is not happening in faraway Waziristan. This new jihad is just on the other side of the Mediterranean. European Union citizens don’t even need a visa to go to Turkey, bordering Syria. Who are these young men and, in some cases, women? What drives them? The days of Al Qaeda cells, of groups formed in radical mosques, easily monitored by police, are gone, experts say. This is the era of “lone wolves” — self-radicalized or radicalized in prison, brainwashed with videos of violence and martyrdom circulated on the Internet. It is essentially illegal for a civilian to possess a gun outside of his home. According to the website of the US consulate, an American who enters Mexico in possession of a firearm can receive thirty years in prison. I wouldn’t mention this if it weren’t for liberals’ incessant prattling about other countries’ “sensible gun laws.” They like to compare gun death statistics from the United States to Japan, Australia, or some other country that severely restricts gun ownership and then draw the facile conclusion that the decisive factor is our laws. Let’s just ignore that pesky Second Amendment and there will never be another murderous rampage, or so goes the argument. Yet Mexico, our southern neighbor, is never their shining example. Peculiar. With such a great case study in the benefits of gun control so close to home, why do they always reach to distant Japan to make their case? Probably because northern Mexico is a warzone where lawmen are routinely gunned down and people have a strange habit of being separated from their heads. The cartels still pack heat but ordinary Mexicans do not because they want to stay on the right side of the law. It would be just as easy to select two counterexamples to demonstrate that gun rights result in safer societies. Gun ownership is a right enshrined in law in Switzerland and a responsibility in Israel. Both have well-armed populaces and lower rates of gun deaths than the US or Mexico. See how easy it is to cherrypick an example to illustrate a point? … There’s no doubt that there’s something seriously out of whack about a society that produces two or three spree-shootings a year. We’ve had so many now I’m losing track. Who will even remember the DC Navy Yard shooter in a few years? How about the guy who shot up the Sikh temple? These days we only remember the biggees—Newtown, Columbine, Virginia Tech, Aurora. It wasn’t always this way. Something changed and it wasn’t our laws or our “access” to firearms. The second amendment has been the law of the land since 1791. Firearms have been with us since the Renaissance. Automatic and semiautomatic weapons were both invented in the nineteenth century. At the risk of sounding corny, I must positively assert that the change has been within us. We’re suffering from a profound sickness of the soul. That’s the cause of our troubles, not the inanimate objects that people use to act out their violent fantasies. Liberals tend to get nervous whenever anyone starts talking about spiritual illness. It all sounds very preachy to them and they worry that someone might use the next spree-shooting as an excuse to censor music lyrics or video games, something I completely oppose. … Liberals will call it scapegoating if I cast blame upon the cultural changes that have swept our country since the mid-1960s, but I must. A few of the lessons that we’ve learned since that time are that it’s all about me, if it feels good do it, and screw the man. God was declared dead on the cover of Time magazine and anyone who warned of eternal consequences was a square. Could those attitudes be responsible for the mayhem unleashed upon our nation? I say yes. … Like the multiplying brooms of Goethe’s “Sorcerer’s Apprentice,” the effects of the empty, nihilistic culture just keep propagating with no end in sight. Conservatives keep thwacking away at those multiplying brooms, getting more and more fatigued with each passing year. No one can deny we’re losing ground. Guns aren’t our problem. It’s the vacuousness that pervades our lives. In generations past our societal immune system would have had some kind of resistance to many of the pathologies that infect us, but no longer. So we pass laws that we think will treat the symptoms and often don’t even do that. We can expect more of the same results in years to come. Beppe Severgnini tries to explain Americans to a bunch of Italian autoworkers at the Fiat-Chrysler plant Melfi, southern Italy. … Control reveals America’s passion for order and predictability. How-to books date from Benjamin Franklin, who was always quick to spot a market niche. America is a nation of optimistic self-improvers, convinced that happiness is above all a question of mind over matter. The books also prove that Americans reject the idea that success comes all at once, without effort or luck. Often, we Italians mistake this for naïveté, but it actually reflects a love of precision and a desire to stay in charge of your own life. Don’t mock it. The second C-word is competition. Americans love it; we fear it. Americans are prepared to lose in order to win, in almost every aspect of life. In Italy — and in most of Europe — we hate losing more than we love winning and tend to settle for an uneventful draw. Come to think of it, competition goes a long way toward explaining the excellence and excesses of the United States, including the abundance of colleges, the number of television channels and the financial instability of the many airlines. You build automobiles here. Your American colleagues know that these automobiles have to be better than the ones your competitors make. If they aren’t, it’s only right that you go bust. For a long time in Italy, we thought that back-scratching regulations and protectionism would save our industry. How wrong we were. Competition in America is more than a healthy economic precept; it’s a moral imperative. The third word on the list is choreography. In Italy, important events like presidential inaugurations, national holidays or graduation ceremonies are slightly boring. Americans are convinced that anything important has also got to be spectacular, if not plain over the top, and ear-splittingly loud.